Cinnamon Sally Designs: Colour Challenge!! 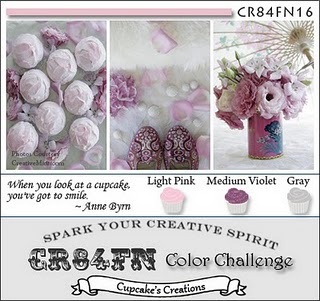 Love this pretty colour palette for the challenge at CR84FN this week, as you know I love colour challenges so had to have a go at this one! Lots of stamps used here and I am really pleased with the finished card, so soft and feminine. Here is a close up of the dragonfly, as you can see I have added some shimmer to the wings. Sorry another quick post but if you stop by tomorrow I can reveal one of the things I have been working on!! Supplies: Hero Arts Stamps, CL383 Antique Engravings. S5507 Envelope Pattern, CG197 Old Letter.G4917 Dandelion. Distress inks, Worn Lipstick and Milled Lavender. 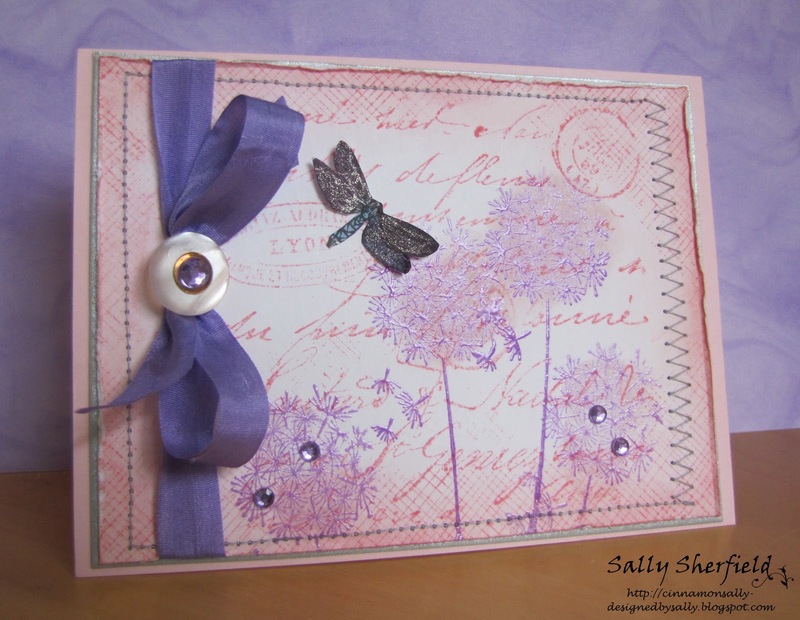 Love this elegant card, Sally! Beautiful layering and a wonderful take on the colors! Very pretty collage and background! Love this, I would never think to mix grey with lighter lavenders and pinks! Very soft and lovely! The embossing gives it a great touch! And, love that button and ribbon! Such a pretty, feminine vintage card. I do like the embossed dandilions - so pretty! Thanks for playing along with CR84FN this week! Love, love, love this card Sally! I love how you used the envelope pattern stamp and I also love how you changed up the stitching! Will be back tomorrow! What a beautiful collage of images Sally! I really love the embossed dandelions and how you used the envelope pattern bg stamp! what a romantic card Sally. such a pretty collage and it is so beautiful. I can imagine that you're happy the way this card turned out. The stamping is gorgeous; the background is a-ma-zing! Thanks so much for playing along at CR84FN! This is GORGEOUS!!! WOW! Love the background! The dragonfly is fabulous! Awesome use of the challenge colors! Thanks so much for playing along with CR84FN!!! This is very pretty! I love the stamped dandelions!! Great job with the colors!! Divine! I adore the embossed dandelion wishes. They are just perfect! 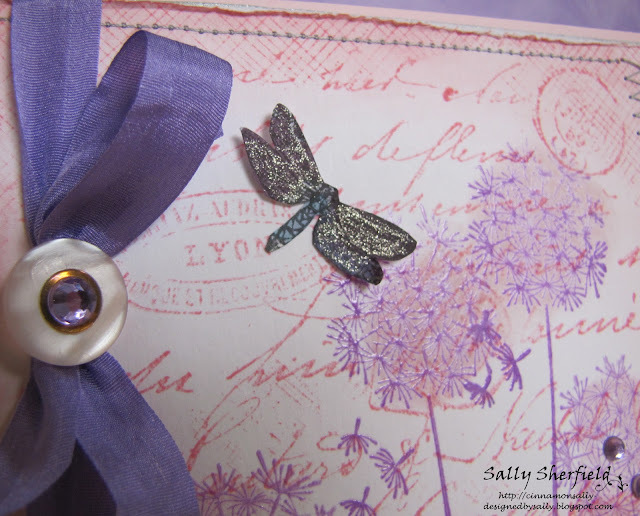 The sweet dragonfly and the letter stamp are so very beautiful singularly but combined as you have...amazing! Beautiful! Love the layering of the dandelion over the background. Wonderful use of the colors! I love all the layers of stamps, what a wonderful effect! I also love that button on your beautiful seam binding! Thanks for playing with CR84FN this week! Gorgeous card, Sally! Love the embossed dandelions and shimmer on the dragonfly! Thanks for playing along with CR84FN! you used those colors so beautifully, Sally! gorgeous card!